Glutamate (Glu) is the major excitatory neurotransmitter in the mammalian central nervous system (CNS), where it plays major roles in multiple aspects, such as development, learning, memory and response to injury (Featherstone, 2010). However, it is well recognized that Glu at high concentrations at the synaptic cleft acts as a toxin, inducing neuronal injury and death (Meldrum, 2000; Ozawa et al., 1998) secondary to activation of glumatergic N-methyl D-aspartate (NMDA) receptors and Ca2+ influx. Glu dyshomeostasis is a consequence of perturbation of astrocyte/neuron interactions and the transport of this amino acid, as will be discussed below. Astrocytes are critically involved in neuronal function and survival, as they produce neurotrophic factors, such as brain-derived neurotrophic factor (BDNF) and glia-derived neurotrophic factor (GDNF), as well as express two main glutamate transporters responsible for the removal of excessive Glu from the synaptic clefts (Chai et al., 2013; Sheldon et al., 2007). Glutamate is the major excitatory neurotransmitter in the CNS, playing a major role in memory and cognitive function (Platt, 1997), and Glu transporters as such prevent the overstimulation of post-synaptic glutamate receptors that lead to excitotoxic neuronal injury (Sattler et al., 2001; Dobble, 1999). Among the five subtypes of Glu transporters identified, glutamate aspartate transporter (GLAST) and Glu transporter-1 (GLT-1) [excitatory amino acid transporter (EAAT) 1 and 2 in humans, respectively], are predominantly expressed in astrocytes. They are responsible for the uptake of excess glutamate from the extracellular space (Furuta et al., 1997; Lehre et al., 1995; Tanaka, 2000), supported by the fact that knockdown of either GLT-1 or GLAST in mice increases extracellular glutamate levels, leading to excitotoxicity related neurodegeneration and progressive paralysis (Bristol and Rothstein, 1996). In the adult brain, EAAT2 accounts for >90% of extracellular glutamate clearance (Danbolt, 2001; Kim et al., 2011; Rothstein et al., 1995), and genetic deletion of both alleles of GLT-1 in mice leads to the development of lethal seizures (Rothstein et al., 1996). On the other hand, EAAT1-3 play a major role during human brain development, in particular in corticogenesis, where they are expressed in proliferative zones and in radial glia, and alterations of Glu transporters contributes to disorganized cortex seen in migration disorders (Furuta et al., 2005;Regan et al., 2007). Indeed, disruption of glutamate signaling is thought to be part of the etiology underlying some neurodevelopmental disorders such as autism and schizophrenia (Chiocchetti et al., 2014; Schwartz et al., 2012). Genetic variants associated with autism spectrum disorders were enriched in glutamatergic pathways, affecting receptor signalling, metabolism and transport (Chiocchetti et al, 2014). Extracellular Glu released by neurons is taken up by astrocytes, which is converted into glutamine (Gln) by glutamine synthetase (GS), a thiol-containing enzyme (cf MIE, Binding to SH-/seleno containing proteins). Intercellular compartmentation of Gln and Glu, the so-called Gln/Glu-GABA cycle (GGC), is critical for optimal CNS function.13C NMR studies have demonstrated that the ratio of Gln/Glu is extremely high and increases with brain activity (Shen et al., 1999). Thus the GGC gives rise to the amino acid neurotransmitters Glu and GABA via dynamic astrocyte neuron interactions. Glu released at synaptic terminals is taken up by surrounding astrocytes via GLT-1 and GLAST (Rothstein et al., 1994; 1996). A small proportion of the astrocytic formed Gln via a reaction mediated by GS is transported into the extracellular space by Gln carriers, with a predominant role for System N/A transporter (SNAT3), which belongs to the bidirectional transporter System N (Chaudhry et al., 2002). In addition to System N, release of Gln from astrocytes is mediated by other transport systems, including Systems L (LAT2) and ASC (ASCT2). 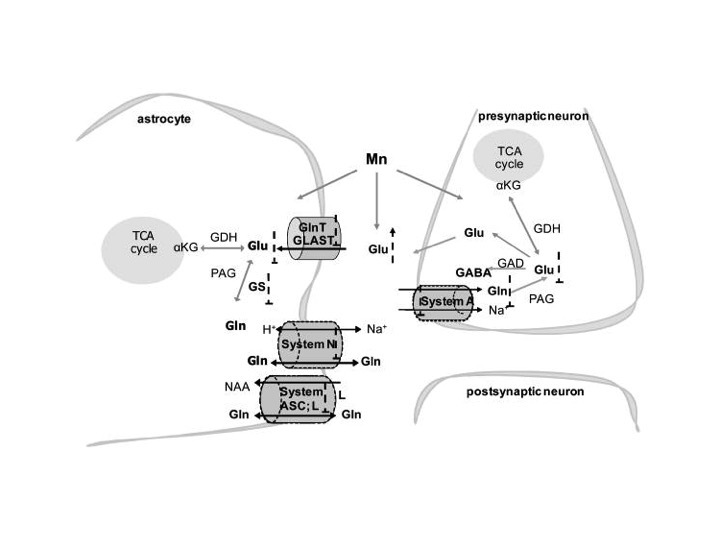 Extracellular Gln is taken up into GABAergic and Glu-ergic neurons by the unidirectional System A transporters SNAT1 (Melone et al., 2004) and SNAT2 (Grewal et al., 2009). Once in neurons, Gln is converted to Glu by the mitochondrial enzyme phosphate-activated glutaminase (Kvamme et al., 2001). Additionally, Glu is packaged into synaptic vesicles by the vesicular VGLUT transporter (Bellocchio et al., 1998), released into the extracellular space and taken up by astrocytes where it is converted back to Gln by GS, thus completing the GGC (Fig. 1). The glutamate uptake activity via EAAT1 can be determined in the presence of dihydrokainic acid (DHK), a specific inhibitor for GLT-1, as described in Mutkus et al. (2005). Glutamate Assay Kit from Abcam (ab83389) provides a sensitive detection method of the glutamate in a variety of samples. This kit will only measure free glutamate levels but not glutamic acid found in the backbone of peptides or proteins. The glutamate Enzyme Mix recognizes glutamate as a specific substrate leading to proportional color development.The amount of glutamate can therefore be easily quantified by colorimetric spectrophotometry at OD = 450 nm. The involvement of glutamate in learning and memory processes is well conserved in all taxa, from invertebrates (ex. Drosophila) to vertebrates (Fagnon and Tuchek, 1995). Arriza JL, Fairman WA, Wadiche JI, Murdoch GH, Kavanaugh MP, Amara SG (1994) Functional comparisons of three glutamate transporter subtypes cloned from human motor cortex. J Neurosci 14(9):5559–5569. Bellocchio EE, Hu H, Pohorille A, Chan J, Pickel VM, Edwards RH. The localization of the brain-specific inorganic phosphate transporter suggests a specific presynaptic role in glutamatergic transmission. J Neurosci. 1998;18:8648–59. Bristol LA, Rothstein JD. Glutamate transporter gene expression in amyotrophic lateral sclerosis motor cortex. Annals of neurology. 1996;39:676–679. Chai L, Guo H, Li H, Wang S, Wang YL, Shi F, Hu LM, Liu Y, Adah D. Scutellarin and caffeic acid ester fraction, active components of Dengzhanxixin injection, upregulate neurotrophins synthesis and release in hypoxia/reoxygenation rat astrocytes. Journal of ethnopharmacology. 2013;150:100–107. Chaudhry FA, Reimer RJ, Edwards RH. The glutamine commute: take the N line and transfer to the A. J Cell Biol. 2002;157:349–55. Chiocchetti, A. G., H. S. Bour and C. M. Freitag (2014). "Glutamatergic candidate genes in autism spectrum disorder: an overview." J Neural Transm (Vienna) 121(9): 1081-1106. Danbolt NC. Glutamate uptake. Progress in neurobiology. 2001;65:1–105. Doble A. The role of excitotoxicity in neurodegenerative disease: implications for therapy. Pharmacology & therapeutics. 1999;81:163–221. Featherstone, D. E. (2010). "Intercellular glutamate signaling in the nervous system and beyond." ACS Chem Neurosci 1(1): 4-12. Furuta A, Rothstein JD, Martin LJ. Glutamate transporter protein subtypes are expressed differentially during rat CNS development. The Journal of neuroscience : the official journal of the Society for Neuroscience. 1997;17:8363–8375. Furuta, A., S. Takashima, H. Yokoo, J. D. Rothstein, K. Wada and T. Iwaki (2005). "Expression of glutamate transporter subtypes during normal human corticogenesis and type II lissencephaly." Brain Res Dev Brain Res 155(2): 155-164. Grewal S, Defamie N, Zhang X, et al. SNAT2 amino acid transporter is regulated by amino acids of the SLC6 gamma-aminobutyric acid transporter subfamily in neocortical neurons and may play no role in delivering glutamine for glutamatergic transmission. J Biol Chem. 2009;284:11224–36. Kim K, Lee SG, Kegelman TP, Su ZZ, Das SK, Dash R, Dasgupta S, Barral PM, Hedvat M, Diaz P, Reed JC, Stebbins JL, Pellecchia M, Sarkar D, Fisher PB. Role of excitatory amino acid transporter-2 (EAAT2) and glutamate in neurodegeneration: opportunities for developing novel therapeutics. Journal of cellular physiology. 2011;226:2484–2493. Kvamme E, Torgner IA, Roberg B. Kinetics and localization of brain phosphate activated glutaminase. J Neurosci Res. 2001;66:951–8. Lehre KP, Levy LM, Ottersen OP, Storm-Mathisen J, Danbolt NC. Differential expression of two glial glutamate transporters in the rat brain: quantitative and immunocytochemical observations. The Journal of neuroscience : the official journal of the Society for Neuroscience. 1995;15:1835–1853. Meldrum, B. S. (2000). "Glutamate as a neurotransmitter in the brain: review of physiology and pathology." J Nutr 130(4S Suppl): 1007S-1015S. Melone M, Quagliano F, Barbaresi P, Varoqui H, Erickson JD, Conti F. Localization of the glutamine transporter SNAT1 in rat cerebral cortex and neighboring structures, with a note on its localization in human cortex. Cereb Cortex. 2004;14:562–74. Mutkus, L., J. L. Aschner, T. Syversen and M. Aschner (2005). "Methylmercury alters the in vitro uptake of glutamate in GLAST- and GLT-1-transfected mutant CHO-K1 cells." Biol Trace Elem Res 107(3): 231-245. Ozawa, S., H. Kamiya and K. Tsuzuki (1998). "Glutamate receptors in the mammalian central nervous system." Prog Neurobiol 54(5): 581-618. Platt SR. The role of glutamate in central nervous system health and disease--a review. Veterinary journal (London, England : 1997) 2007;173:278–286. Regan MR, Huang YH, Kim YS, Dykes-Hoberg MI, Jin L, Watkins AM, Bergles DE, Rothstein JD. Variations in promoter activity reveal a differential expression and physiology of glutamate transporters by glia in the developing and mature CNS. The Journal of neuroscience : the official journal of the Society for Neuroscience. 2007;27:6607–6619. Rothstein JD, Martin L, Levey AI, et al. Localization of neuronal and glial glutamate transporters. Neuron. 1994;13:713–25. Rothstein JD, Van Kammen M, Levey AI, Martin LJ, Kuncl RW. Selective loss of glial glutamate transporter GLT-1 in amyotrophic lateral sclerosis. Annals of neurology. 1995;38:73–84. Rothstein JD, Dykes-Hoberg M, Pardo CA, Bristol LA, Jin L, Kuncl RW, Kanai Y, Hediger MA, Wang Y, Schielke JP, Welty DF. Knockout of glutamate transporters reveals a major role for astroglial transport in excitotoxicity and clearance of glutamate. Neuron. 1996;16:675–686. Sattler R, Tymianski M. Molecular mechanisms of glutamate receptor-mediated excitotoxic neuronal cell death. Molecular neurobiology. 2001;24:107–129. Schwartz, C. E. and G. Neri (2012). "Autism and intellectual disability: two sides of the same coin." Am J Med Genet C Semin Med Genet 160C(2): 89-90. Sheldon AL, Robinson MB. The role of glutamate transporters in neurodegenerative diseases and potential opportunities for intervention. Neurochemistry international. 2007;51:333–355. Shen J, Petersen KF, Behar KL, et al. Determination of the rate of the glutamate/glutamine cycle in the human brain by in vivo 13C NMR. Proc Natl Acad Sci U S A. 1999;96:8235–40. Sidoryk-Wegrzynowicz M1, Aschner M. Manganese toxicity in the central nervous system: the glutamine/glutamate-γ-aminobutyric acid cycle. J Intern Med. 2013 May;273(5):466-77. doi: 10.1111/joim.12040. Tanaka K. Functions of glutamate transporters in the brain. Neuroscience research. 2000;37:15–19.